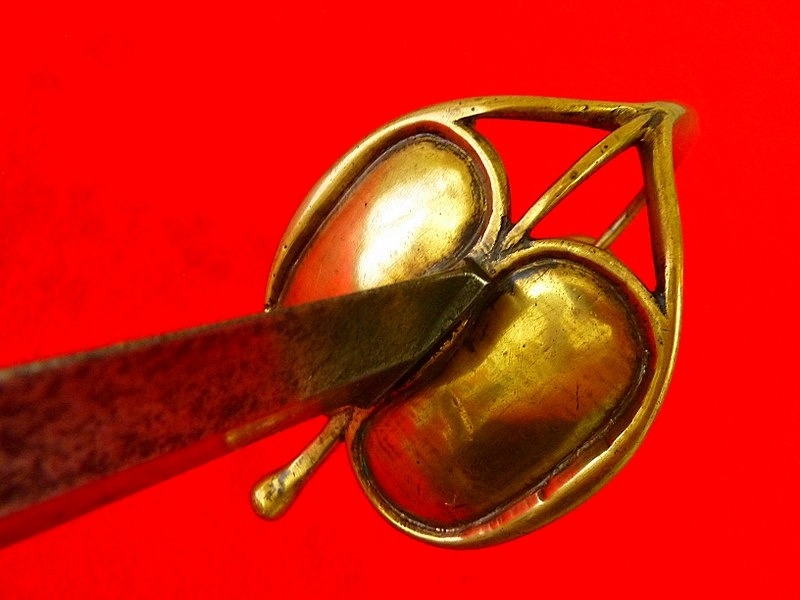 I really like those Urn pommelled american NCO swords! I have been following the auction of a few on Ebay. The one that recently went with the scabbard intact was a relative bargain. The other I have seen relisted was bumped up in asking price, counter intuitive but some feel a higher price increases the draw. The market is being very odd at both extremes lately. I have had to sit on my hands during some of the end games that have seen a few go for pennies while quite mundane examples have at times been bringing much more than real value. Some of that due to what may have been simply attractive descriptions without knowing what the truths are. Very ordinary swords selling to the appeal of novice buyers. Me? I collapse and by cheap stuff with issues most of the time. 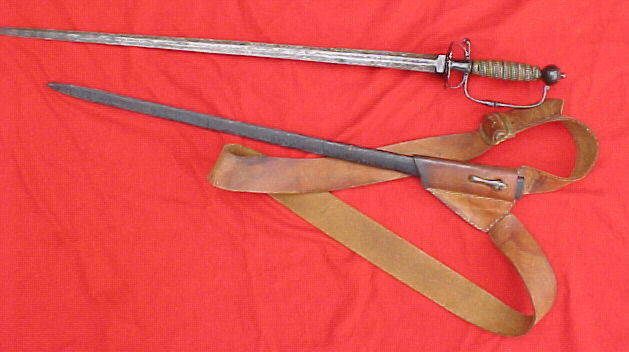 Peterson shows the stirrup hilt as being found with American officers' swords until 1840 or so--I don't suppose that the Mexican officers were much different in this regard--they probably shared that lag time as with the states. It is a nice sword there. Nice one. 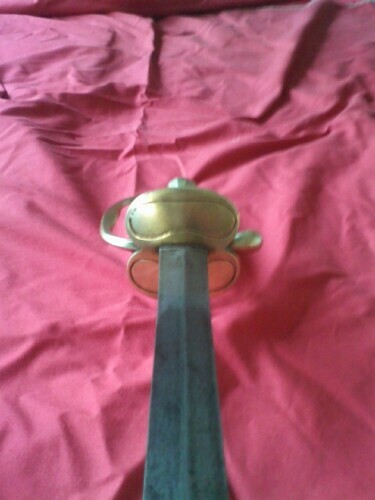 Could be a NCO sword. 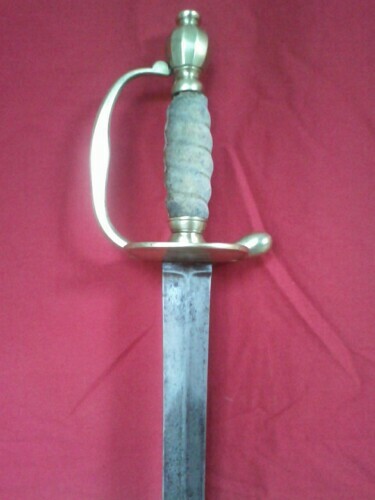 Here is a nice infantry officer sword. 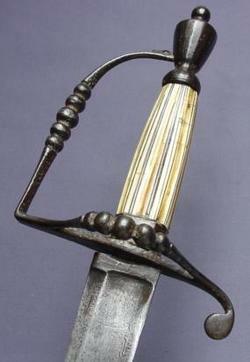 It has a 17th century rapier blade on it. The scabbard is of course a much later additiion. Very nice. A truly massive example of this first half of the 18th cen. 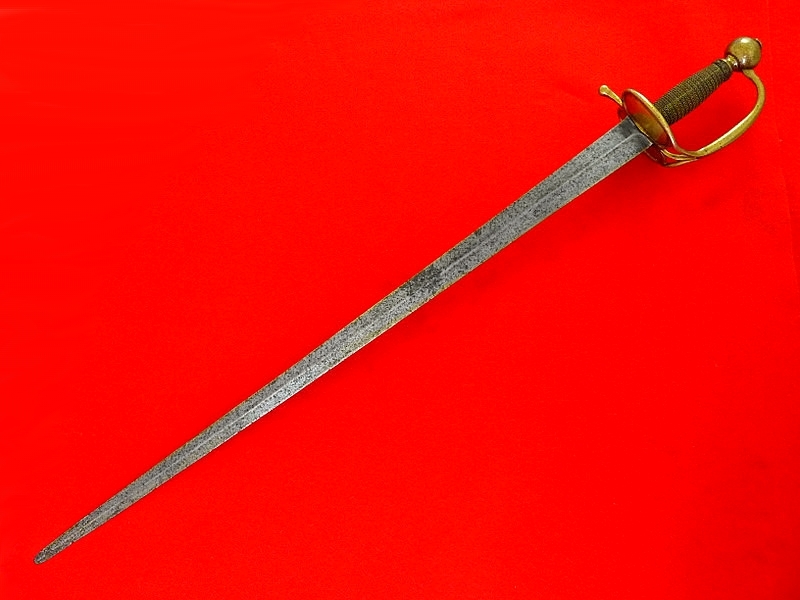 model either English or French Cuirassier's Palash, wearing a fabulous broad double edged blade of diamond section, exhibiting fine pitting and lovely light patina throughout, bare of markings and with a slightly worn tip. 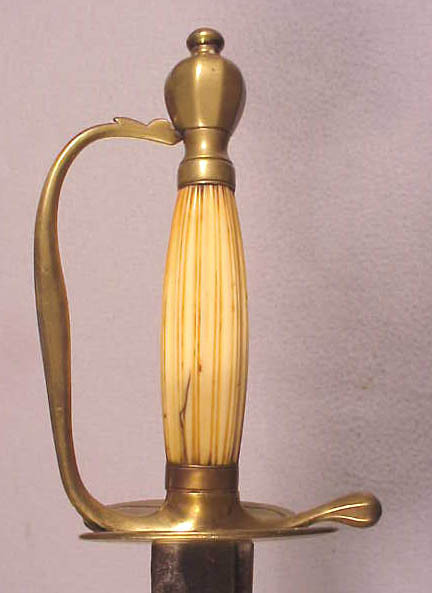 Massive brass mounted hilt sized for large hand in a glove with braided silver wire grip, all perfectly intact and solid on this Rare example. There have been some pretty interesting swords moving the past few months. 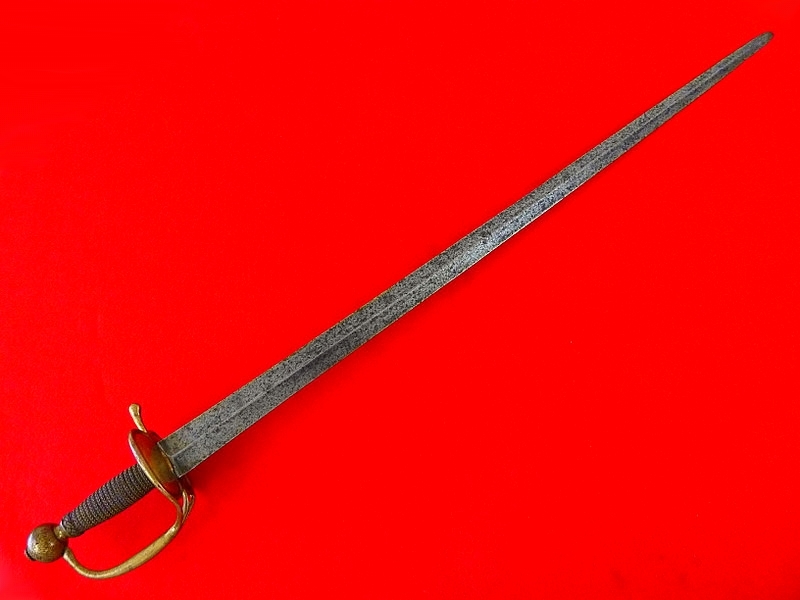 This sabre below just went for a pretty good price (for what it is.). Pretty enough that I saved it in my files, as I could only enjoy it in viewing. Yep, I recalled looking at that one myself. Do you think the blade and hilt are original or composite? I see nothing suspicious of that one Morgan. 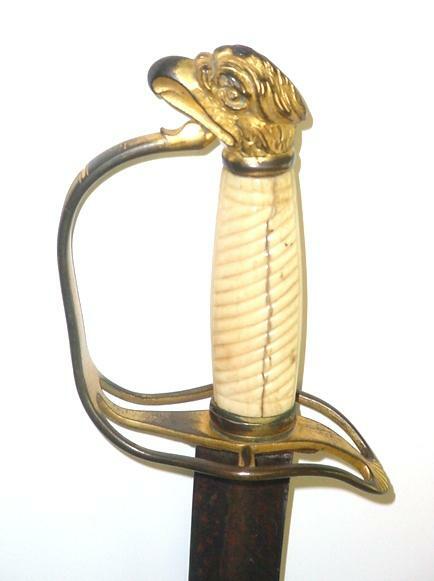 Today's favorite is one of the Osborn eagle's with a slotted hilt. I am looking for one like this but as a spadroon blade. It must be ivory or bone and a b&g decorated example. 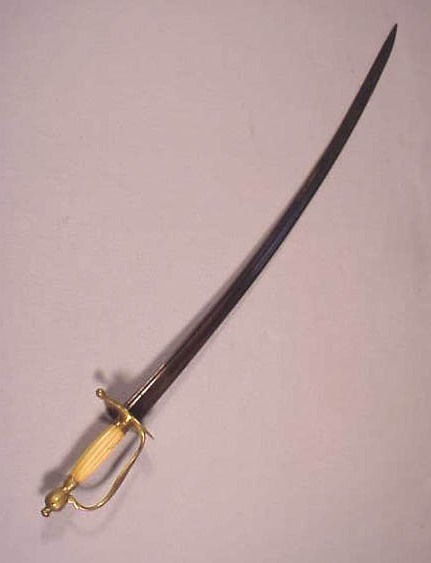 (this sabre is nice but not quite what I'm looking for in my ensemble). I am also looking for a dark hilted Bolton but with a plain stirrup or slotted hilt and as an undecorated sabre.instead of a spadroon. Adopting those two very specific examples would pretty much end a short list of priority. 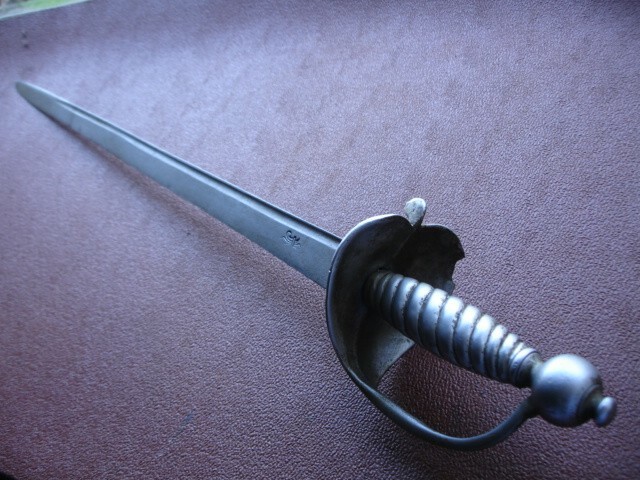 I just found a picture of a French 1740's infantry sword on the Montpellier Infantry museum. 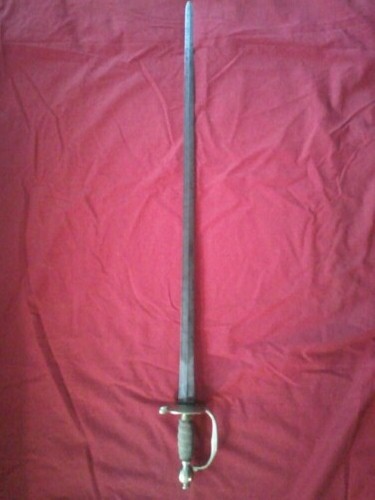 As posted earlier in this thread, I have a very similar sword in my collection. Nice blade on that Epee du Soldat, David. Did that just have one shell guard or two? 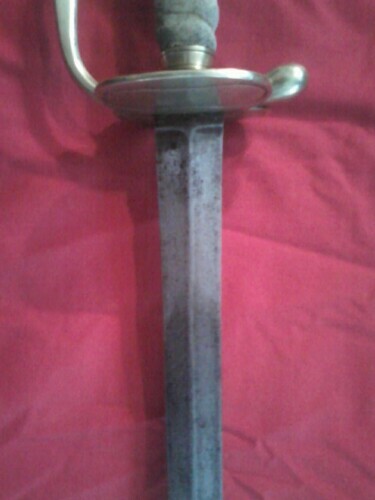 Here is a sword that is up for identification, It's on its way to me from England so I may have another week to wait. 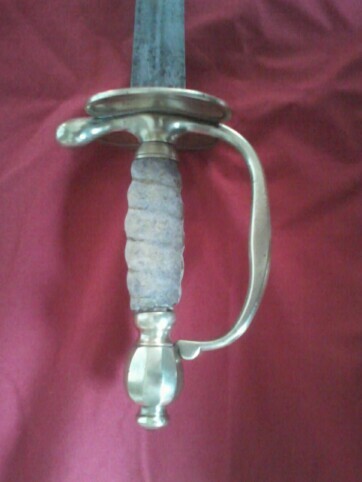 The hilt and cast grip are steel. The blade is single edged and 26 inches long with a nice Fluer de Lie on each side of the blade. Any ideas? Interesting sword! 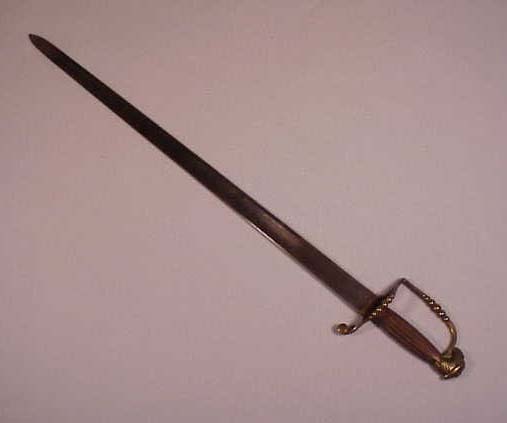 I'd vote for a continental origin for it (to my eyes, it's got a French feel to the hilt), based on the quillon shape and ball pommel, although I suppose it could just as well be English. It would be good to find a photo of an intact example so we could see what the missing side branch looked like. 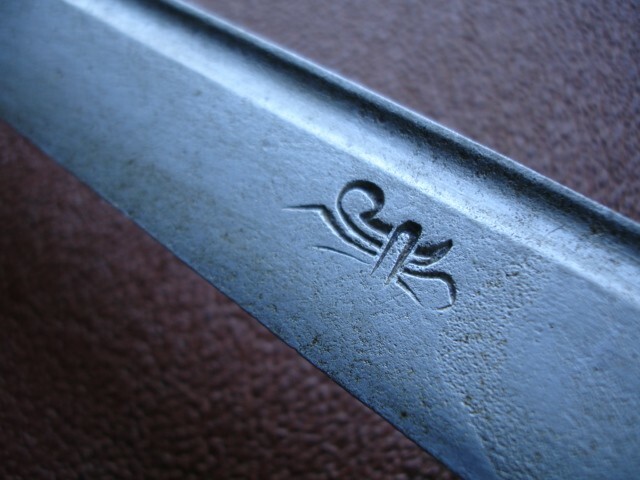 As I recall, Neumann has several swords pictured that have fleur-de-lis stamps on the blades, but the hilts are English. Is the grip really a steel casting? I was under the impression that steel casting wasn't perfected until the mid-late 1800s. 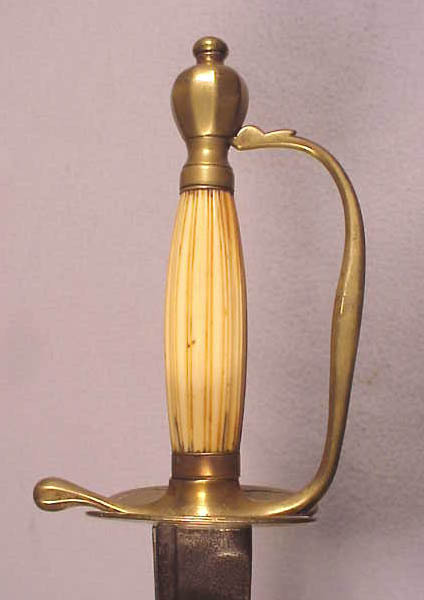 Well I know that the French and English both had examples of brass cast grips by the 1720's. You'll find examples of a few french ones on this thread. I just haven't seen an all steel version on this particular patten. 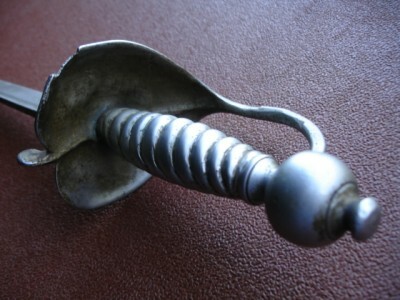 Neuman has an example of a English hanger that's all steel, but that is a 1690's model. I don't think this is that old. 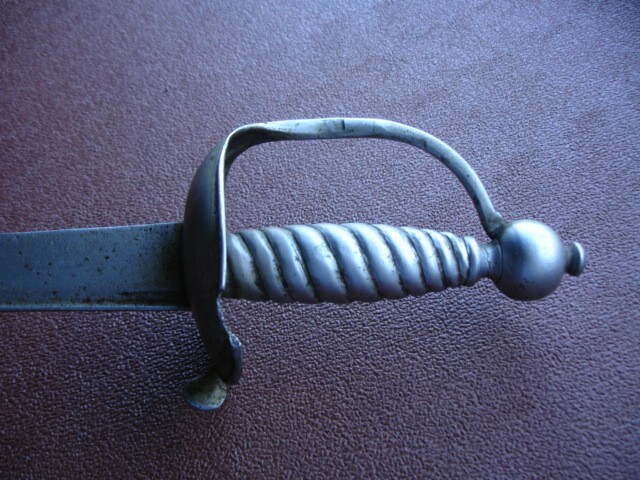 He does have examples of French infantry Hangers that have the english style hilt but they are still french. Also I wonder about the unit markings on the guard. 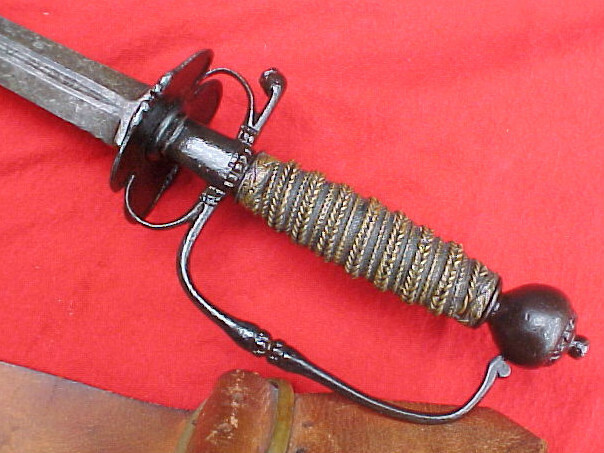 Did the French put unit markings on their hilts? Maybe David Ledoyan will know. 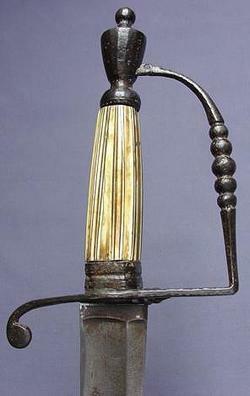 Apparently (From Dmitry on SFI) the Fleur de lie was also a British martial marking of the mid 18 century, when they were put on both sides of the blade. Does anyone else know about that? 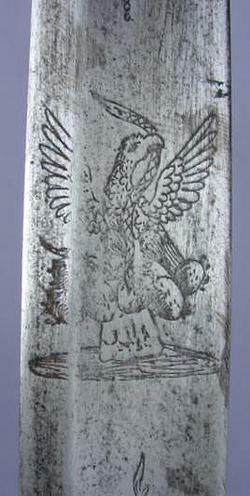 I would opt for this sword to be a grenadier hanger c.1740-1760 from a regiment whose "lace" was silver. In British army regiments at that time, officer's trim was either silver or gold and other accourtrements corresponded to that scheme. Officers swords would be silver or gold hilted, etc. 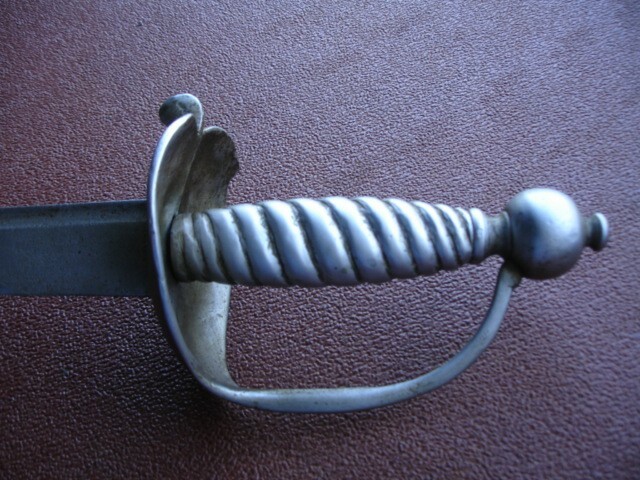 I believe this to have been a British sword with a broken branch guard made for a "silver" regiment. As the Ordnance supplied these swords, the fleur d'lys showing a cutler contract just makes my guess seem right. With all due respect to Mr. Ericson, of course! Very interesting, I had no idea about the fluer di lie's being English. I found some similar examples in Nueman. S.13 and S.14. And I forgot about matching buttons, buckles and other metal facings on uniforms. Well, I look forward to to it's arrival! 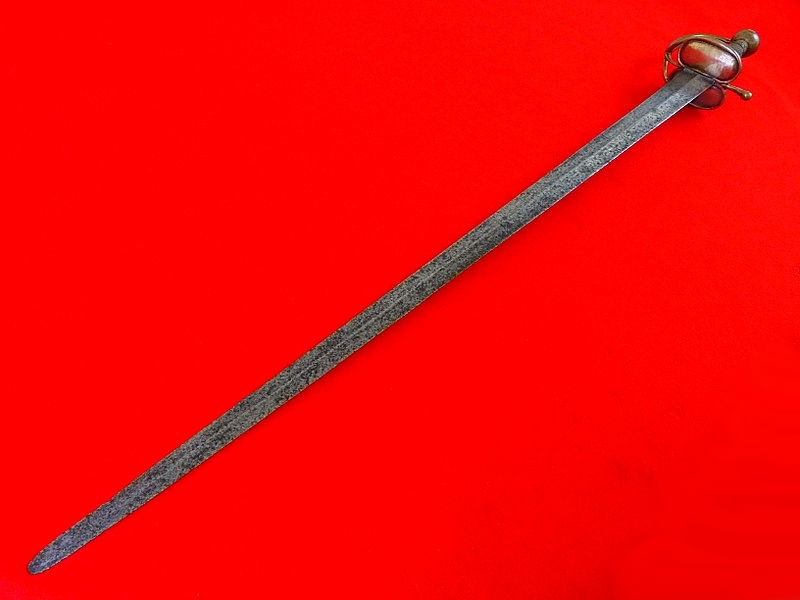 I just acquired an impressive British Infantry Officer sword that is a nice variation of the 86-88 pattern and may predate it. 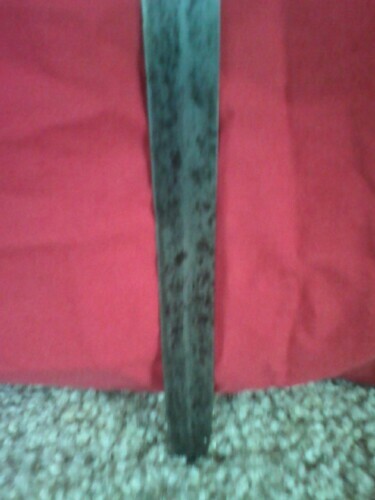 It has a 31 inch double edged blade that has a suprisingly nice balance and heft. 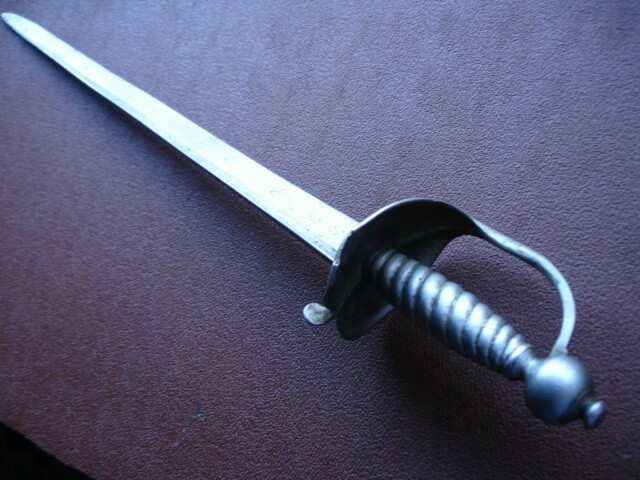 It is one and a quarter inches wide at the forte.The pommel is larger than my other 1788 spadroon and has a thicker knuckle guard, as well as a shagreen grip. It is very iconic to hold. It makes me want to yell "Rule Britannia!" when I grasp it. The brass seems to be of a yellower content when cleaned up than my other hilts of this type. 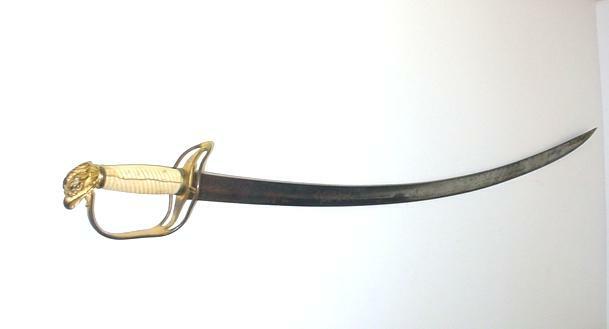 The blade really reminds me of some larger french cavalry swords of the first half of the 18th cen. that I have seen.